Here are some good LAST MINUTE, LOW-COST Valentine's Day ideas! Mix ingredients. Form into balls. Chill. Melt 1 pkg. chocolate chips and 1 TB shortening so chocolate won't be too thick. Then roll balls in milk chocolate! Crush oreos, melt cream cheese, combine. Form into balls. Chill. Melt 1 pkg. chocolate chips and 1 TB shortening so chocolate won't be too thick. Then roll balls in chocolate! Melt chocolate chips and 1 TB shortening so chocolate won't be too thick. 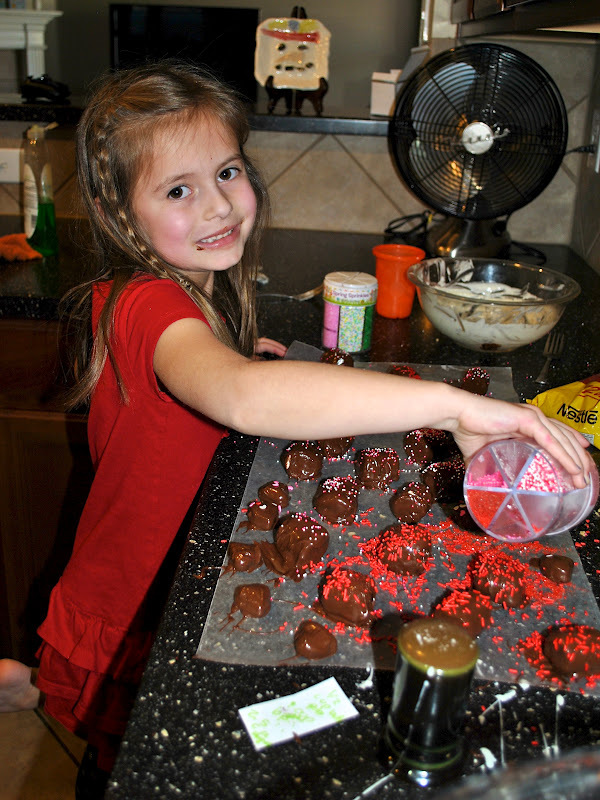 Sprinkle with fun sprinkles! 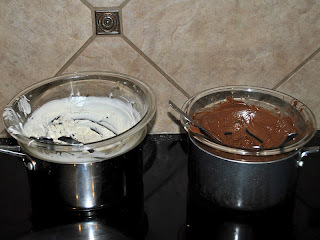 For melting the chocolate I recommend using a double broiler or this set-up, which is my ghetto double broiler! Works great and keeps the chocolate from hardening, just simmer hot water in the pan underneath. 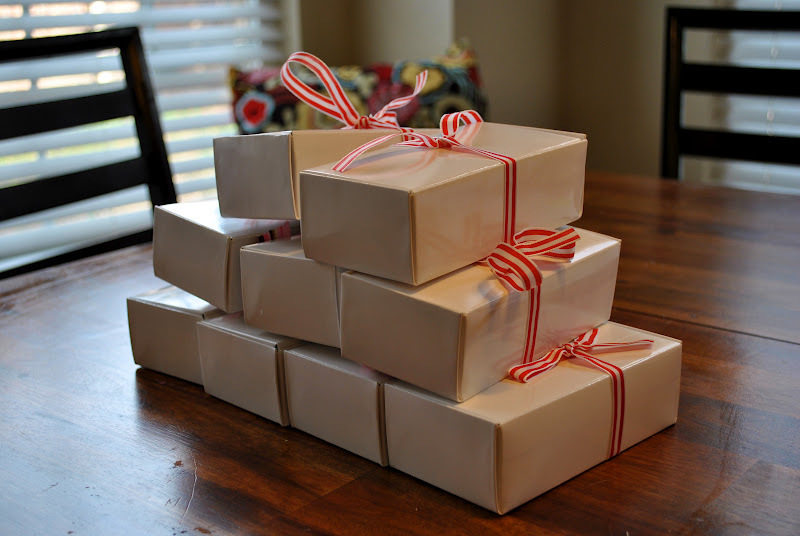 Wrap in cute boxes and you're on your way! My "lucky" husband has been getting little surprises on his night stand for the last few days. 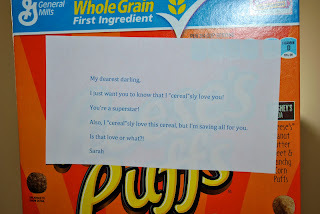 Mostly just corny little notes tapped to food. But hey, it's funny, right. I mean I do "cereal"sly love him :) You can pretty much find a way to make any kind of food a Valentine. Yesterday he got donuts that said "I'm do'nuts' about you!" 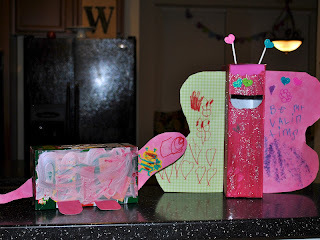 This was our first year making Valentine's mailboxes. 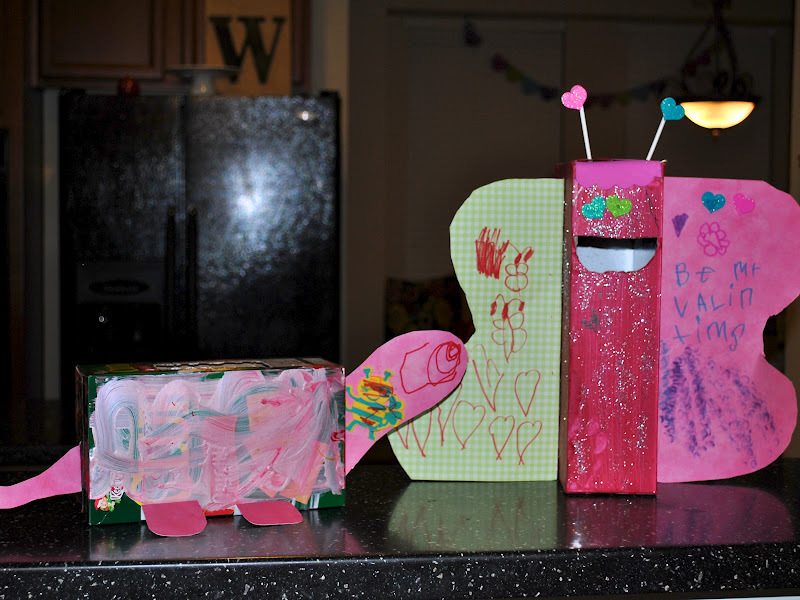 Obviously we are not award winning artists here, but my kids had a blast making their Valentine boxes this year, and they did them pretty much by themselves (as you can probably tell)! In case you can't figure out what you're looking at Jaxon's is a dinosaur and Madi's is a butterfly! Your truffles look delicious!! 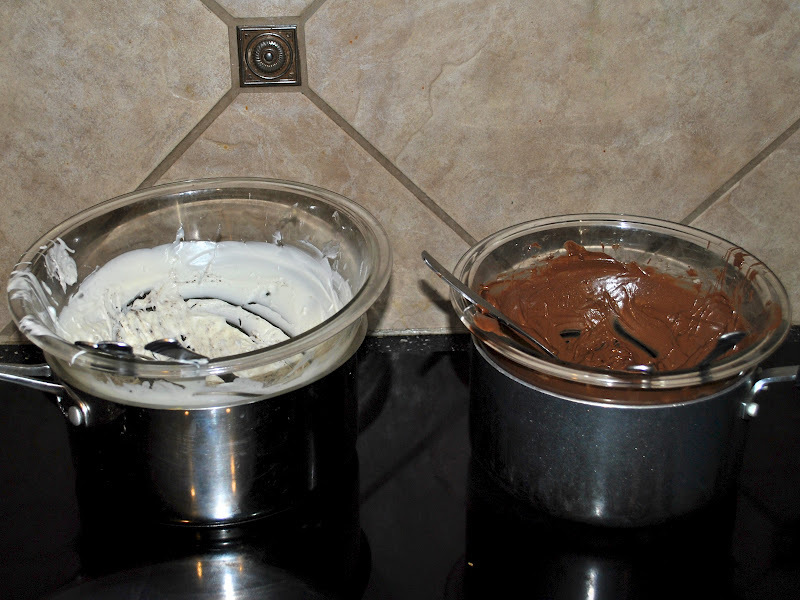 I always think about making something like that but the double boiler thing always intimidates me! Seriously, with the whole glass bowl on top of the pan set-up it's super, super easy. You just put the chocolate in and then stir it occasionally until it melts. I actually think it's even easier than melting chocolate in the microwave because on the stove it doesn't burn or get hard. i want to see the vow so bad! but so many people said they were disappointed! I am going to take your word for it. I liked it. But I'm not a movie snob, so I'm pretty easily pleased. It was a fun chick flick. Not gonna win any awards, but definitely one of those movies that makes me all mushy inside. still trying to decide if i should go see this with my hubby. also love valentine boxes. This recipe looks delish. I'm jealous that you got to see The Vow... I'm dying to see it! I can't until it comes to DVD so for now I'll just hear about it and be jeal! Oh goodness! I really need to make those! Mmm! I've heard so much about The Vow. It looks like one I'll have to see! I just found your blog and so glad I did. I'm your newest fan and follower! 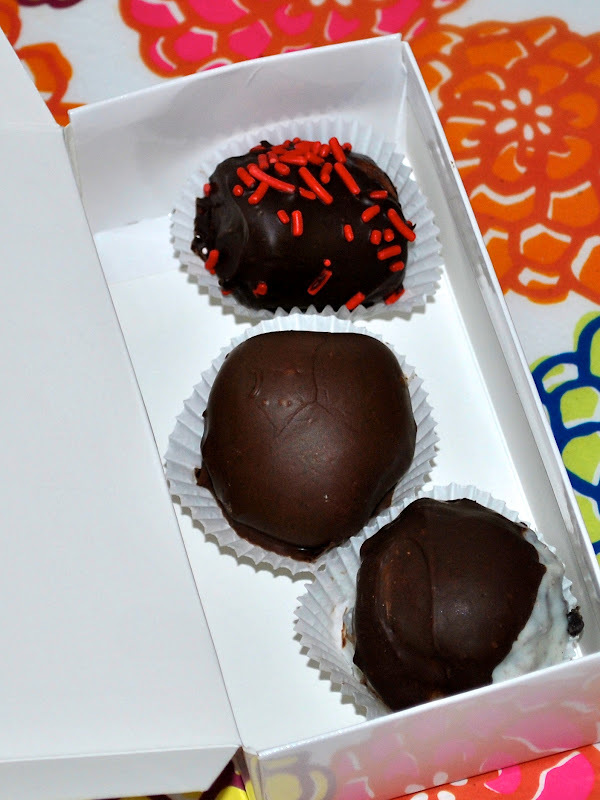 Oreo Truffles?! YummmmM! Your little assistant is adorable. I'm planning on watching The Vow with the boyfie over the weekend. I can't wait to watch it.